Description (ebay): Evelots Slide Under Shelf Sturdy Wire Baskets w/ Back Space Saver Organizer, S/2. This set of 2 under shelf basket will add extra storage space instantly to your pantry, cabinets, or closet. Under shelf basket with backing helps maximize storage space by holding sandwich bags, foil boxes, pantry food, lightweight dishes, clothing, towels, toiletries and more. The wire rack shelf is durable and attractive to eliminate clutter in style, and sturdy enough to hold up to 10 lbs. without bending or sagging. Shelf cleans easily by wiping with a damp cloth. These easy to install storage shelves simply slide onto your existing shelves, no hardware required. The rubber tips on the arms hold the shelves in place while loading and unloading objects, yet the shelves can be endlessly moved for optimal storage as your needs change, and remove easily with no damage to original shelf. Package includes two (2) wire rack under shelf storage shelves. Approximate measurements of each basket: 12 Inches Long x 13 Inches Wide x 5.4 Inches Height overall. Basket without the shelf brackets measures 12 Inches Long x 12.5 Inches Wide x 4 Inches Height. Fits shelves that are 1.4 Inches thick or smaller. *Evelots is a brand of Green Mountain Imports, LLC and is exclusively distributed by Green Mountain Imports. *Evelots has more than 500 products to offer. Please don't forget to visit our Amazon store. For International Shipments: Import duties, taxes, and charges are not included in the listed price and are the buyer's responsibility. - Durable and attractive, eliminates clutter in style. Grid pattern is lightweight and sleek, but sturdy enough to hold up to 10 lbs without bending or sagging. Cleans easily by wiping with a damp cloth. 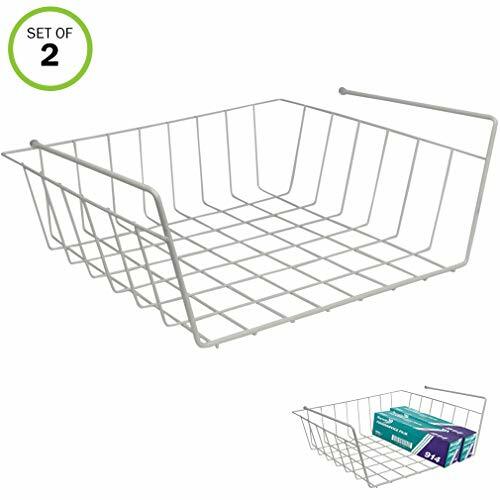 - This set of 2 under shelf basket will add extra storage space in seconds! Maximize storage in pantry, cabinets, and closet. Great for sandwich bags, foil, food, lightweight dishes, clothing, towels, toiletries and more. - Easy to install! Shelf securely attaches to top shelf by simply sliding in, no hardware needed. Rubber tips on arms prevent shelf from moving when loading and unloading items. Wire shelf can be repeatedly moved for optimal storage and removes easily with no damage to original shelf. - Two shelf baskets included. Approximate measurements of each basket: 12 Inches Long x 13 Inches Wide x 5.4 Inches Height overall. Basket without the shelf brackets measures 12 Inches Long x 12.5 Inches Wide x 4 Inches Height. Fits shelves that are 1.4 Inches thick or smaller.